Birmingham Fence Contractors aims to provide local homeowners and business establishments with wooden fencing of the highest quality. Furthermore, it’s our goal to provide a level of service that can’t be matched by our many competitors. Our enterprise does so by working with clients personally alongside them throughout the entire course of the project which they want to get finished. In doing so, a healthy and lasting relationship gets established. Every single client has their own set of specific needs that we must cater to. Sometimes, they need others to assist them with planning everything beforehand. Nonetheless, many people also contact us with an idea that’s already in their minds. In such cases, we simply check if what’s on their mind is feasible and recommend the best kind of wood for them to utilise when having their fence built. In addition to creating all sorts of fences, we also create gates and posts for gardens which we diligently install in a manner that is efficient and fast. Following everything, any leftover clutter from the job gets cleaned up before our workers leave the premises. The manner in which we conduct business was formulated to decrease the chances of disturbing anyone as we get the project done. After all, we know that our clients live busy lives and mustn’t get disturbed simply because they’re having a fence erected on their premises. Although there are many alternative materials that can get used to build fences, wood still remains to be the most popular of all. The reason for that is because it’s affordable, durable, versatile, and is easy to create thanks to modern manufacturing techniques. Moreover, wooden fences provide a warm rustic feeling that anyone can appreciate. Lastly, they’re quite easy to install, maintain, and even supplant when required. ​The western redcedar or Thuja plicata is an evergreen coniferous tree that’s a member of the cypress family. It’s native to the western parts of North America and was brought over to England during the Columbian Exchange. The tree’s wood is widely used as timber by many industries as it is attractive, light, aromatic, and incredibly resistant to decay. Like most species, this one has many cultivars. A few of which have even been given the Award of Garden Merit by the Royal Horticultural Society because of their admirable natural traits. Individuals that plan on having an expensive-looking wooden fence erected are recommended to look no further than the western redcedar. Any fence that’s created using it is certain to last for quite a while and look great around wherever you have it installed. While the material isn’t the cheapest option available, it’s indeed the best choice for those that consider hardiness as a major factor when it comes to selecting a fence. Additionally, having us build and install such a fence actually saves money in the long run since the cost of maintenance is very low. In some instances, the fence can even last for decades before it needs a little upkeep. ​Wooden fence panels are the perfect choice for those who are looking for something that’s affordable and easier to install when compared to closeboards. Birmingham Fence Contractors is proud to say that we build and supply a lot of panel fences which may either have a wooden post or one that’s made out of concrete with gravel boards. The thing which gives concrete gravel boards a good advantage is the fact that they keep your wooden fence away from undergrowth and soil. Consequently, the rate at which the fence’s material is going to decay will really take a long time. As a matter of fact, even treated wooden posts can’t match their concrete counterparts. Given that, it’s best to erect concrete posts instead of wooden ones as they have the ability to increase your fence’s lifespan and minimize its upkeep. Panels have an almost unlimited amount of designs. Our clients may select designs which are either intricate or simple in nature. In any case, it’s almost guaranteed that you’ll find something from our wide catalog that fits your style. Apart from that, we also know that as an individual, you have specific standards which must be followed. Hence, some of the panels that we supply were designed to provide the highest level of security and privacy. It’s a nice idea to consider putting up a fence to seclude your garden from other places on your property that might be unsightly. You might wish to hide wheelie bins or prevent visitors from seeing your compost pile. 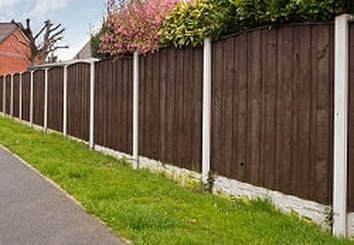 Another great thing to do is use a fence to divide your business or home’s outdoor areas. Getting that done is a fantastic way to individualise sections of the open space which you have. Our team supplies many different kinds of wooden gates so you can properly choose the best one for your place. Your imagination is the only thing which limits you in regards to the matter as we have gates that have a contemporary, classical, and a traditional design. If nothing from our selection meets fits you, it’s also possible to have a custom gate built using a personal design. Boundary garden gates must always have a built solidly to offer utmost security and privacy. In comparison, internal gates often aren’t as strong as they’re mostly created for with a certain aesthetic in mind. Due to that, there are more designs of the latter than the former type of gate. Although it might seem that installing a gate is easy, doing it wrongly can bring about many adverse effects. For example, the privacy of your home or business might get compromised. Because of that, it’s arguably better to have us install your gate to ensure that everything gets done properly. Always remember that we’re always here to fulfill all your requirements. Birmingham Fence Contractors is free to contact at any time and we’re even willing to give you complimentary advice about anything that’s related to fencing. To make things even better, we even give a free quote for the project that you want us to get done. Call us at 0121 405 1202 or fill up the form on this site to get in touch with us.